To Cite: Rahimi F, Goli S, Soltani N, Rezaei H, Amouzeshi Z. Effects of Complementary Therapies on Labor Pain: A Literature Review, Mod Care J. 2018 ; 15(1):e69306. doi: 10.5812/modernc.69306. Context: Labor is among the most painful events in females’ lives. Labor pain (LP) is alleviated using both pharmacological and non - pharmacological methods. The current study aimed at reviewing clinical trials in Iran as well as other countries on the effects of acupressure, aromatherapy, and massage therapy on LP. Evidence Acquisition: In the current review study, online databases such as SID, Iranmedex, Magiran, IranDoc, Cochrane library, PubMed, and Google Scholar were searched to retrieve studies published before 2017 in Persian or English language. Search keywords were labor pain, acupressure, aromatherapy, and massage as well as their Persian equivalents. Retrieved clinical trials were appraised using the Jadad checklist. Data were analyzed qualitatively. Results: In total, 46 clinical trials were enrolled. Most studies reported the positive effects of acupressure, aromatherapy, and massage therapy on labor pain. The most frequently used therapies were aromatherapy with lavender essential oil and acupressure on the LI4 and SP6 points. Conclusions: Acupressure, aromatherapy, and massage therapy were effective in alleviating labor pain. These techniques are mostly safe without serious side effects for parturient females and their babies. Therefore, they can be used to alleviate labor pain. Labor pain (LP) intensity is one of the most severe pains that almost all females experience (1, 2). LP is mild in 15%, moderate in 35%, severe in 30%, and extremely severe in 20% of the cases (3). Giving birth is one of the most important events in mother’s life and is a physiological process (4). LP may lead to loss of emotional control, which plays a key role in experiencing a traumatic delivery (5) and psychological disorders (6). LP and fear of experiencing the pain may also increase the tendency toward cesarean delivery (7). Such complications necessitate the use of methods decreasing LP. Today, various pharmacological and non - pharmacological methods are used to reduce LP (8). There are considerable advantages in the application of non - pharmacological LP relief techniques with few side effects for both the mother and fetus and no interference with labor process (9). The use of complementary and alternative medicine (CAM) to manage LP is greatly developed in the last decade (1). The most common complementary therapies for pain alleviation are reflexology, acupuncture, acupressure, massage, and aromatherapies (10). The use of medicinal plants is greatly increased in recent years. Essential oils extracted from aromatic plants can significantly reduce stress and anxiety, promote relaxation, stimulate endorphin release, and alleviate LP (11, 12). Acupressure is also a complementary therapy. Acupressure creates balance between two opposites, except vital forces in the body, i e, yin and yang. In acupressure, certain points on the body surface are compressed using hands or other devices in order to provide balance in the flow of forces in certain hypothetical pathways called meridians (13, 14). In fact, acupressure is similar to acupuncture, but it does not need needle insertion, and hence, is free of acupuncture side effects such as fainting, infection, bleeding, and hepatitis (13). According to acupressure, there are 12 main meridians or invisible channels throughout the body. Any imbalance in the meridians can decrease or increase energy level in some areas of the body, which finally result in disorders (15). It is supposed that meridian blockages during labor cause LP. Thus, stimulation of acupoints via acupressure or acupuncture can clearly block and restore normal functioning of the meridians. Some researchers believe that acupressure and acupuncture can alleviate pain through blocking pain transmission and stimulation of endorphin release (16). Acupoints, which can be used for LP alleviation, are located on hands, feet, and ears (17). Different clinical trials assessed the effects of acupressure, aromatherapy, and massage therapy on LP. The current study aimed at reviewing clinical trials conducted in Iran and other areas of the world on the effects of acupressure, aromatherapy, and massage therapy on LP. (((Acupressure [Title/Abstract]) OR Massage [Title/Abstract]) OR Aromatherapy [Title/Abstract]) AND LP [Title/Abstract]. Clinical trials included in the current review study were conducted on 18 - 35 - year - old females in the gestational age of 37 - 42 weeks (based on the date of last menstruation period or ultrasound findings before the gestational age of 12 weeks), with a singleton pregnancy and a live fetus in the cephalic presentation who were in the active phase of labor and regular uterine contractions (three contractions per 10 minutes), with no history of infertility, need for cesarean section, and pregnancy complications (such as bleeding, hypertension, and premature delivery). Clinical trials with accessible online full - texts were included in the current review and the Jadad checklist was used for their appraisal. Accordingly, clinical trials with a Jadad score ≥ 3 were included (Figure 1). The Jadad checklist, with a total score of 0 - 5, assesses biases in randomization, patient follow - up, and blinding. Based on the effects of aromatherapy on LP, most studies (N = 10) used lavender and conducted through aromatherapy, aromatherapy massage therapy, aromatherapy bath, and smoke aromatherapy. Table 1 summarizes the studies on the effects of aromatherapy on LP. In the area of acupressure and LP, seven studies applied acupressure on the SP6 point, five on the LI4 point, one on the GB21 and SP6 points, and two on the GB21 point. The studies are summarized in Table 2. Respecting the effects of massage therapy on LP, 22 studies were retrieved. However, 12 papers were excluded due to their ineligibility and Jadad scores of < 3. Therefore, 10 studies were included; most of them assessed the effects of Swedish massage, as well as effleurage and stroking movements applied on the abdomen, waist, sacrum, back, buttocks, shoulders, and feet. Table 3 provides a summary of the studies. Aromatherapy is used to alleviate pain, anxiety, depression, insomnia, fatigue, and asthma, and even to increase self - confidence, maximize success, and promote creativity. Essential oils are used through oral, dermal (massage, compress, or bath), and inhalation routes (21). A study reported that aromatherapy massage using jasmine, geranium, lavender, and rose essential oils had positive effects on parturient females’ mind (19). Inhalation of essential oils between uterine contractions can stimulate endorphin release and alleviate LP (12). Lavender is native to the Mediterranean region. Because of its pleasant aroma and therapeutic effects, it was brought to other areas by migrants. Lavender aromatherapy is used to treat depression, amenorrhea, vaginitis, insomnia, and pain. In ancient medicine, lavender has been used for its antitussive, carminative, antispasmodic, sedative, and diuretic effects. Lavender contains linalool, ketones, esters, and aldehyde. Ketones in lavender effectively reduce pain and inflammation and promote sleep. Esters also prevent muscle spasms and reduce tension and depression. Cold compress on the forehead using lavender and salvia can reduce fatigue and refresh the mind (19). Several studies reported that aromatherapy with lavender essential oil significantly alleviated LP (18-26). Peppermint essential oil is produced through distilling its flowers and twigs. As a colorless or yellowish - green liquid with a strong aroma and taste, peppermint essential oil contains menthol, menthone, and menthyl acetate. It alleviates abdominal cramps, relaxes lower esophageal sphincter, smooth muscles, coordinates the movements of gastrointestinal tract, alleviates colon spasms, and exerts carminative and digestive effects. The menthol component of peppermint essential oil affects kappa opioid receptors and blocks pain transmission and thereby, brings pain alleviation. Besides, inhalation aromatherapy with peppermint essential oil alleviates anxiety through reducing the release of corticotropin - releasing hormone from hypothalamus, adrenocorticotropin from pituitary, and cortisol from adrenal. A study showed that peppermint significantly alleviated LP and anxiety (27). Clove is another plant used in aromatherapy. The active ingredient of clove (Caryophyllus aromaticus L.) is eugenol and has antioxidant, analgesic, anti-inflammatory, and anti - microbial effects. Clove also includes considerable amounts of essential oils. Other compounds found in clove include caryophyllene, alcohol, benzylic, dimethylbenzoate, and flavonoids. The latter is among the inhibitors of nitric oxide. The inhibition of nitric oxide reduces pain perception. Moreover, flavonoids reduce intracellular calcium through inhibiting N - methyl - D - aspartate (NMDA), which subsequently, reduces the activity of nitric oxide synthase and calcium - dependent phospholipase A2. These reductions result in the reduction of nitric oxide and prostaglandins, which in turn, brings pain alleviation. A study showed the greater effectiveness of clove aromatherapy than peppermint aromatherapy in LP alleviation (28). Rosewater is made through the distillation of water - steeped damask rose petals. Rosewater and other damask rose essential oils can reduce pain or at least prevent pain aggravation. Aromas stimulate receptors in the olfactory bulb, which sends olfactory signals to the limbic system. The limbic system is the center of emotion in the brain. In response to stress, the system produces enkephalin, endorphin, and serotonin and thereby, induces sedation and alleviates pain (29, 30). Previous studies reported that aromatherapy with rosewater in the first stage of labor significantly alleviated LP (29, 30). Another study showed the effectiveness of damask rose essential oil in alleviation of anxiety in parturient females during labor (31). In Iranian traditional medicine, sesame oil is considered as a thermogenic, emollient, relaxant, and tonic agent. It is used to prepare parturient females for delivery, because it relaxes muscles as well as abdominal and pelvic organs. In Ayurvedic medicine, sesame oil is used for health maintenance and promotion, massage therapy, and many other therapeutic purposes. Biochemical analyses showed that sesame oil contains seven components with analgesic effects. A study found that massage therapy with sesame oil applied on the back, sacrum, and the lateral sides of the spine could significantly alleviate LP and shorten labor length (32). Chamomile is an aromatic plant. The term chamomile means small flowers with apple - like aroma. It has diuretic, digestive, lactogenic, antipyretic, analgesic, and antimicrobial effects. A study showed that aromatherapy with chamomile was helpful in alleviating LP (33). The essential oils of orange and geranium are familiar and popular aromatic compounds. Orange essential oil has sedative, analgesic, muscle relaxant, anti - inflammatory, and antihypertensive effects. It is a stimulant for the central nervous system (CNS). Geranium also has anti - inflammatory, anti - hemorrhagic, antiseptic, analgesic, diuretic, and muscle relaxant effects. It can alleviate chest pain, menopause - related health problems, and pain associated with shingles. The essential oils of geranium, jasmine, lavender, and rose seem to have positive effects on parturient females’ mind during labor (35). A study showed that orange essential oil significantly alleviated LP, while geranium essential oil had no significant effects on it (59). The essential oil of bitter orange blossom is among the essential oils used for aromatherapy. Bitter orange, Citrus aurantium, is a 3 - 5 - meter tree with a round - shaped crown planted in Northern and Southern areas of Iran. Its flowers spread over the axes of branches singularly or in groups. Flowers have yellowish - white thick and juicy aromatic petals, on which oil - secreting tricums are clearly seen. Bitter orange blossoms have 0.2% essential oil, called neroli oil. There are more than 10 compounds in bitter orange essential oil, mainly monoterpenes such as limonene, linalool, alpha - terpineol, beta - pinene, and neryl acetate. Bitter orange essential oil has antidepressant, antiseptic, antispasmodic, libido - boosting, and mild sedative effects. Previous studies reported that its use in prenatal, perinatal, and postnatal periods was safe and had no significant side effects. The limonene component of bitter orange essential oil can alleviate LP by inhibiting cyclooxygenase - 1 and -2 and reducing prostaglandins in the body. A study showed that bitter orange essential oil significantly alleviated LP during the first stage of labor (11). Salvia is native to the Mediterranean countries and is also found in Iran. Its brewed leaves are used for therapeutic purposes for many years. It has coagulant, anticonvulsive, antispasmodic, antiseptic, antibiotic, antioxidant, and analgesic effects and can reduce LP and lactation. An earlier study indicated that aromatherapy with salvia alleviated LP (36). Different types of aromatherapy with different types of essential oils had positive effects on LP (34, 60). Of course, lavender is the most effective and the most frequently used aromatic plant for LP. Therefore, lavender aromatherapy is recommended for LP alleviation. The SP6 or the San Yin Jiao point is the most important acupoint used to alleviate pain. It is commonly used to manage gynecological disorders. This point is four fingers above the medial malleolus on the posterior border of the tibia. Different studies showed that SP6 acupressure in the first stage of labor significantly decreased LP intensity (37-41). Another study reported that transcutaneous electrical nerve stimulation and SP6 acupressure were significantly effective in alleviating LP (43). A study showed that acupressure with BL32 and GB21 points was ineffective for labor pain in examined females (42). The LI4 or the He GU point is one of the most important points of the large intestine meridian. It is located on the dorsal surface of the hand between the first and the second metacarpal bones. Previous studies in different areas of Iran reported the effectiveness of LI4 acupressure for the alleviation of LP (16, 44-46). The GB21 point is located on the midpoint of the hypothetical line, which connects the seventh cervical vertebra to the highest point of the shoulder. Different studies showed that acupressure on the GB21 point significantly decreased LP intensity (47, 48). The most commonly used massage therapy techniques for LP include stroking, effleurage, Swedish massage, and rhythmic massage applied on the sacrum, buttocks, shoulders, back, and ankle. Most previous studies found that massage therapy techniques were effective in LP alleviation (49-58). A study showed that although massage therapy could alleviate LP during the first and second stages of labor, it had no significant effects on LP in the third stage of labor (58). The current study concluded that acupressure, aromatherapy, and massage therapy are effective in LP alleviation. The most frequently used therapies were aromatherapy with lavender essential oil and acupressure on the LI4 and SP6 points. These techniques are mostly safe and not associated with serious side effects for parturient females and their babies. Therefore, they can be used to effectively alleviate LP. One of the limitations of the present study was the inclusion of only Persian and English literatures. Moreover, the included studies used different tools to assess LP. Such variation might have affected the study results. 1. 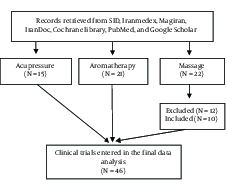 Ranjbaran M, Khorsandi M, Matourypour P, Shamsi M. Effect of Massage Therapy on Labor Pain Reduction in Primiparous Women: A Systematic Review and Meta-analysis of Randomized Controlled Clinical Trials in Iran. Iran J Nurs Midwifery Res. 2017;22(4):257-61. doi: 10.4103/ijnmr.IJNMR_109_16. [PubMed: 28904535]. [PubMed Central: PMC5590352]. 2. Hajiamini Z, Masoud SN, Ebadi A, Mahboubh A, Matin AA. Comparing the effects of ice massage and acupressure on labor pain reduction. Complement Ther Clin Pract. 2012;18(3):169-72. doi: 10.1016/j.ctcp.2012.05.003. [PubMed: 22789793]. 3. Abushaikha L, Oweis A. Labour pain experience and intensity: a Jordanian perspective. Int J Nurs Pract. 2005;11(1):33-8. doi: 10.1111/j.1440-172X.2005.00496.x. [PubMed: 15610342]. 4. Kashanian M, Shahali S. Effects of acupressure at the Sanyinjiao point (SP6) on the process of active phase of labor in nulliparas women. J Matern Fetal Neonatal Med. 2009:1-4. doi: 10.1080/14767050903277662. [PubMed: 19757334]. 5. Garthus-Niegel S, Knoph C, von Soest T, Nielsen CS, Eberhard-Gran M. The role of labor pain and overall birth experience in the development of posttraumatic stress symptoms: a longitudinal cohort study. Birth. 2014;41(1):108-15. doi: 10.1111/birt.12093. [PubMed: 24654643]. 6. Jokic-Begic N, Zigic L, Nakic Rados S. Anxiety and anxiety sensitivity as predictors of fear of childbirth: different patterns for nulliparous and parous women. J Psychosom Obstet Gynaecol. 2014;35(1):22-8. doi: 10.3109/0167482X.2013.866647. [PubMed: 24328559]. 7. Azami-Aghdash S, Ghojazadeh M, Dehdilani N, Mohammadi M, Asl Amin Abad R. Prevalence and Causes of Cesarean Section in Iran: Systematic Review and Meta-Analysis. Iran J Public Health. 2014;43(5):545-55. [PubMed: 26060756]. [PubMed Central: PMC4449402]. 8. Yesilcicek Calik K, Komurcu N. Effects of SP6 Acupuncture Point Stimulation on Labor Pain and Duration of Labor. Iran Red Crescent Med J. 2014;16(10). e16461. doi: 10.5812/ircmj.16461. [PubMed: 25558386]. [PubMed Central: PMC4270652]. 9. Samadi P, Alipour Z, Lamyian M. The Effect of Acupressure at Spleen 6 Acupuncture Point on the Anxiety Level and Sedative and Analgesics Consumption of Women during Labor: A Randomized, Single-blind Clinical Trial. Iran J Nurs Midwifery Res. 2018;23(2):87-92. doi: 10.4103/ijnmr.IJNMR_199_16. [PubMed: 29628954]. [PubMed Central: PMC5881236]. 10. Smith CA, Levett KM, Collins CT, Jones L. Manual healing methods including massage and reflexology for pain management in labour. Cochrane Database Syst Rev. 2011;9:1-8. 11. Namazi M, Amir Ali Akbari S, Mojab F, Talebi A, Alavi Majd H, Jannesari S. Effects of citrus aurantium (bitter orange) on the severity of first-stage labor pain. Iran J Pharm Res. 2014;13(3):1011-8. [PubMed: 25276203]. [PubMed Central: PMC4177623]. 12. Lynne R, Lynne N. "Aromatherapy in midwifery" Aromatherapy. World summer. 1993:13-5. 13. Yang J. Clinical application of point sanyinjiao. J Tradit Chin Med. 2001;21(4):291-3. [PubMed: 12014134]. 14. Lee EJ, Frazier SK. The efficacy of acupressure for symptom management: a systematic review. J Pain Symptom Manage. 2011;42(4):589-603. doi: 10.1016/j.jpainsymman.2011.01.007. [PubMed: 21531533]. [PubMed Central: PMC3154967]. 15. Cook A, Wilcox G. Pressuring pain. Alternative therapies for labor pain management. AWHONN Lifelines. 1997;1(2):36-41. [PubMed: 9208747]. 16. Kaviani M, Ashoori M, Azima S, RajaeiFard A, HadianFard MJ. [Comparing the effect of two methods of acupressure and ice massage on the pain, anxiety levels and labor length in the point LI-4]. J Shahid Sadoughi Univ Med Sci. 2012;20(2):220-8. Persian. 17. Jones L, Othman M, Dowswell T, Alfirevic Z, Gates S, Newburn M, et al. Pain management for women in labour: an overview of systematic reviews. Cochrane Database Syst Rev. 2012;(3). CD009234. doi: 10.1002/14651858.CD009234.pub2. [PubMed: 22419342]. 18. Vakilian K, Atarha M, Bekhradi R, Chaman R. Healing advantages of lavender essential oil during episiotomy recovery: a clinical trial. Complement Ther Clin Pract. 2011;17(1):50-3. doi: 10.1016/j.ctcp.2010.05.006. [PubMed: 21168115]. 19. Seraji A, Vakilian K. [The comparison between the effects of aromatherapy with lavender and reathing techniques on the reduction of labor pain]. Compl Med J Fac Nurs & Midwifery. 2011;1(1):31-9. Persian. 20. Ahmadi A, Karimi S, Aj N, Javadi A. [The effect of lavender essence on labor pain in nulliparous women referred to kuosar hospital 2010]. Edrak J. 2013;32(10-9). Persian. 21. Pirak A, Salehian T, Yazdkhasti M, Didehvar M, Arzani A. [The Effect of Lavender Essence on Labor Pain and Length of Delivery Time in Nulliparous Women]. Sci J Ilam Univ Med Sci. 2015;23(6):175-84. 22. Alavi N, Nemati M, Kaviani M, Tabaie MH. [The effect of Lavender Aromatherapy on the pain intensity perception and intrapartum outcomes in primipara]. Armaghane-danesh. 2010;15(1):30-7. Persian. 23. Mohammadkhani Shahri L, Abbaspour Z, Aghel N, Mohammadkhani Shahri H. [Effect of massage aromatherapy with Lavender oil on pain intensity of active phase of labor in nulliparous women.Journal of medicinal plants]. J Med Plants. 2012;11 (Supp 9):167-76. Persian. 24. Burns E, Zobbi V, Panzeri D, Oskrochi R, Regalia A. Aromatherapy in childbirth: A pilot randomised controlled trial. BJOG. 2007;114:838-44. 25. Raju J, Singh M. Effectiveness of Aromatherapy and Biofeedback in Promotion of Labour Outcome during Childbirth among Primigravidas. Health Sci J. 2015;9(1):1-5. 26. Mansour Lamadah S. The Effect of Aromatherapy Massage Using Lavender Oil on the Level of Pain and Anxiety During Labour Among Primigravida Women. Am J Nurs Sci. 2016;5(2):37. doi: 10.11648/j.ajns.20160502.11. 27. Ozgoli G, Aryamanesh Z, Mojab F, Alavi Majd H. [Study of inhalation of peppermint aroma on the pain and anxiety of the first stage of labor in nulliparous women: a randomized clinical trial]. Qom Univ Med Sci J. 2013;7(3):21-7. Persian. 28. Ozgoli G, Torkashvand SH, Salehi moghadam F, Boromand niya N, Farazmajab F, Minoee S. [Comparison of Peppermint and Clove essential oil aroma on pain intensity and anxiety at first stage of labor]. The Iranian Journal of Obstetrics, Gynecology and Infertility. 2016;19(21):1-11. Persian. 29. Vahabi SH, Abedi P, Afshari P, Haghighizade M, Zargani M. [Effect of aromatherapy with rose water on labor pain in nulliparous women: a randomized clinical trial]. J Rafsanjan Univ Med Sci. 2015;14:1049-60. Persian. 30. Roozbahani N, Attarha M, Akbari Torkestani N, Amiri Farahani L, Heidari T. [The effect of rose wateraromatherapy on reducing labor pain in primiparouswomen]. Complement Med. 2015;5(1):1042-53. Persian. 31. Setayeshvali Pour N, Kheirkhah M, Neisani L, Haghani H. [Comparison of the effects of aromatherapy with essential oils of damask rose and hot footbath on the first stage of labor anxiety in Nulliparous women]. Complement Med. 2012;2(2):126-34. Persian. 32. Asgari M, Alavi A, Dashtinejad E, Vahabi SH. Persian [The effect of massage on pain and back with sesame oil Nulliparous women during childbirth]. J Rafsanjan Univ Med Sci. 2015;14:1049-60. Persian. 33. Heidaryfard S, Amir Ali Akbari S, Mojab F, Shakeri N. [Effect of Matricaria Camomilla Aroma on Severity of first stage Labor Pain]. J Clin Nurs Midwifery. 2015;4(3):23-31. Persian. 34. Tork Zahrani SH, Dasumi SH, Tansaz M, Akbarzadeh A. [The effects of peganeum Harmala Smoke cervical ripening, initiation and outcome of labor]. J Med History. 2016;8(27):151-78. Persian. 35. Rashidi Fakari F, Tabatabaee Chehr M, Rashidi Fakari F, Mortazavi H, Kamali H, Tayebi V. [Effects of aromatherapy on pain of labor in nulliparous women]. J North Khorasan Univ Med Sci. 2013;5(2):359-62. Persian. doi: 10.29252/jnkums.5.2.359. 36. Kaviani M, Maghbool S, Azima S, Tabaei SM. [The effect of aromatherapy with salvia officinalis on the severity of labor pain in nulliparous women]. J Urmia Nurs Midwifery Facul. 2014;12(2):79-85. Persian. 37. Heidari P, Mojdeh F, Mazloom R, Tanbakoi K, Judaki K. [Effect of acupressure on labor pain intensity]. Hakim Res J. 2008;11(2):39-46. Persian. 38. Kordi M, RohaniMashadi S, Fadaee A, Esmaili H. [Effects of SP6 acupressure on reducing the labor pain during the first stage of delivery]. Iran J Obatetrics, Gynecol & Infertility. 2010;12(4):7-12. Persian. 39. Samadi P, Lamiyan M, Heshmat R, Faghihzadeh S. [Effect of acupressure at SP6 point on labor pain intensity]. J Hormozgan Univ Med Sci. 2010;14(1):55-64. Persian. 40. Salehian T, Safdari-Dehcheshmehi F, Alavi A, Rahimi-Madiseh M. [Effect of acupressure at the Sanyinjiao point (SP6) on labor pain and delivery time in nulliparous women]. Shahrekord Univ Med Sci J. 2011;12(4):8-14. Persian. 41. Lee MK, Chang SB, Kang DH. Effects of SP6 acupressure on labor pain and length of delivery time in women during labor. J Altern Complement Med. 2004;10(6):959-65. doi: 10.1089/acm.2004.10.959. [PubMed: 15673989]. 42. Seyyedzadeh Aghdam N, Vakilian K, Dawood Abadi M. [Effect of BL32 and GB21 acupressure on labor pain in the first stage of labor]. Compl Med J Facul Nurs & Midwifery. 2012;2(1):104-10. Persian. 43. Hossein Pour N, Kaviani M, Razaghi M. [Comparison of effect of transcutaneous electrical nerve stimulation and acupressure in decreasing labor pain in primiparous women]. Iran J Obstetrics, Gynecol & Infertility. 2012;15(12):27-33. Persian. 44. Ozgoli G, Sedigh S, Heshmat R. Effect of right hand hegu acupressure on pain intensity of active phase of labor in primiparous women. Trauma Mon. 2010;2009(04, Winter):229-34. 45. Hamidzadeh A, Shahpourian F, JamshidiOrak R. [Effect of LI4 acupressure on labor pain in the first stage of labor]. Koomesh. 2011;12(2):196-203. Persian. 46. Kordi M, Firoozi M, Esmaili H. [Effect of LI4 acupressure on labor pain in the first stage of labor in nuliparous women]. J Hayat. 2011;16(3):95-101. Persian. 47. Akbarzadeh M, Moradi Z, Zare N, Hadiyanfard MJ, Jokar A. [Comparing the effect of acupressure at two GB-21 and SP-6 points on the pain severity of active phase of delivery among primiparous women]. Armaghan-danesh. 2012;16(6):498-506. Persian. 48. Chung UL, Hung LC, Kuo SC, Huang CL. Effects of LI4 and BL 67 acupressure on labor pain and uterine contractions in the first stage of labor. J Nurs Res. 2003;11(4):251-60. [PubMed: 14685931]. 49. Kimber L, McNabb M, Mc Court C, Haines A, Brocklehurst P. Massage or music for pain relief in labour: a pilot randomised placebo controlled trial. Eur J Pain. 2008;12(8):961-9. doi: 10.1016/j.ejpain.2008.01.004. [PubMed: 18304848]. 50. Abasi Z, Abedian Z, Hasanpour Azghadi SB, Fadaei A, Esmaeili H. [Study of the effects of massage therapy on the labor intensity fatigue]. J Sabzevar Univ Med Sci. 2007;14(3):172-8. Persian. 51. Khodakarami N, Safarzadeh A, Fathizadeh N. The effects of massage therapy on labour pain severity and pregnancy outcome. Eur J pain. 2006;10(S1). Persian. S214. doi: 10.1016/S1090-3801(06)60825-2. 52. Chang M-Y, Wang S-Y, Chen C-H. Effects of massage on pain and anxiety during labour: a randomized controlled trial in Taiwan. J Adv Nurs. 2002;38(1):68-73. doi: 10.1046/j.1365-2648.2002.02147.x. 53. Silva Gallo RB, Santana LS, Jorge Ferreira CH, Marcolin AC, Polineto OB, Duarte G, et al. Massage reduced severity of pain during labour: a randomised trial. J Physiother. 2013;59(2):109-16. doi: 10.1016/S1836-9553(13)70163-2. [PubMed: 23663796]. 54. Taghinejad H, Delpisheh A, Suhrabi Z. Comparison between massage and music therapies to relieve the severity of labor pain. Womens Health (Lond). 2010;6(3):377-81. doi: 10.2217/whe.10.15. [PubMed: 20426604]. 55. Safdari Dehcheshmeh F, Delaram M, Salehian T, Moradi MT, Rahimi Madiseh M, Aliakbari F. [Relief of labor pain by ice massage of the hand]. Zahedan Journal of Research in Medical Sciences. 2009;11(1):21-30. Persian. 56. Mortazavi SH, Khaki S, Moradi R, Heidari K, Vasegh Rahimparvar SF. Effects of massage therapy and presence of attendant on pain, anxiety and satisfaction during labor. Arch Gynecol Obstet. 2012;286(1):19-23. doi: 10.1007/s00404-012-2227-4. [PubMed: 22271239]. 57. Chang MY, Chen CH, Huang KF. A comparison of massage effects on labor pain using the McGill Pain Questionnaire. J Nurs Res. 2006;14(3):190-7. [PubMed: 16967401]. 58. Field T, Hernandez-Reif M, Taylor S, Quintino O, Burman I. Labor pain is reduced by massage therapy. J Psychosom Obstet Gynaecol. 1997;18(4):286-91. [PubMed: 9443139]. 59. Tournaire M, Theau-Yonneau A. Complementary and alternative approaches to pain relief during labor. Evid Based Complement Alternat Med. 2007;4(4):409-17. doi: 10.1093/ecam/nem012. [PubMed: 18227907]. [PubMed Central: PMC2176140]. 60. Ghiyasi A, Hasani M, Mola Ahmadi L, Hashem Zade M, Haseli AF. [Review of randomized controlled trials on the efficacy of aromatherapy on pain relief]. Iran J Obatetrics, Gynecol & Infertility. 2017;20(2):89-105. Persian.